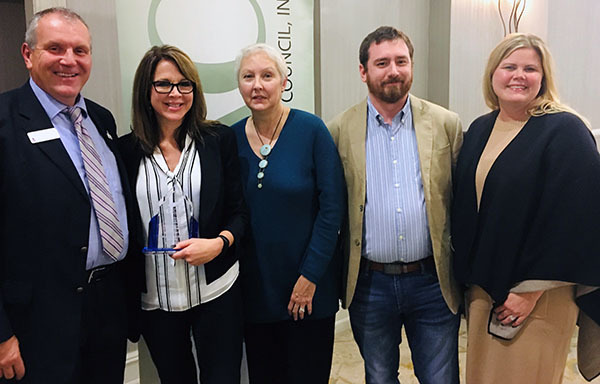 Cheryl Carty, second from left, is shown at the GEAC awards ceremony with, l-r, Dr. Christopher Blake, MGA president; Renee Pearman, marketing director; Lee Greenway, communications director; and Jenn Stenander, vice president for Enrollment Management. The Georgia Education Advancement Council (GEAC) has recognized Cheryl Carty, Middle Georgia State University's chief marketing officer and assistant vice president, for individual achievement in marketing and communications. GEAC is a statewide organization for those at public and private colleges and universities who work in educational advancement, including the areas of alumni, development, publications, and communications. Carty was nominated for the award by Dr. Christopher Blake, Middle Georgia State's president, and received it at GEAC's fall 2018 conference in Savannah. Carty joined what is now Middle Georgia State University (MGA) in 2014 not long after the institution was created through the consolidation of two previous colleges. "She was faced with a number of challenges," Blake said. "There was a new institutional name and brand identity to promote, as well as a second pending institutional name and brand as the institution was positioning to become a university and offer graduate degrees. Middle Georgia State had a unique feature - an aviation program with a statewide mission - and five campuses spread across 718 square miles, which included urban, rural, residential, and commuter campuses. Cheryl took the reins and went to work developing a marketing campaign that centered on students, and a tagline of 'Find Your Greatness' was created. She and her team worked to deliver short-term results while cueing up for a broader, more significant promotion once the institution was elevated to a state university." When state university approval was received, Carty and her team knew that the success of the new university brand depended on working with the university’s larger community to develop and then amplify the new brand identity. She led the effort to develop a comprehensive brand identity that would keep key elements of the most recent rebranding. To ensure buy-in, the wider university community was involved in reviewing and providing input on logo concepts. The result was a sleek, modern design that reflected Georgia’s newest public university. In the three years since the new university was formed and launched, the Office of Marketing and Communications has supported the institution’s strategic planning and the growth of graduate programs. There have been enrollment related challenges due to increased admissions requirements; however, fall 2018 is a record-breaking semester for new student interest and enrollment. The university welcomed its largest group of incoming students in its five-year history. Much of the success in attracting new students to the can be attributed to the new brand identity and the efforts of the marketing and communications team led by Carty. Especially noteworthy is the work of Carty and her team in significantly increasing enrollment in the university's School of Aviation degree programs. Carty serves on the Middle Georgia State president's cabinet and is a member of the strategic planning board and enrollment management committee. She also serves on the Jones County College and Career Academy Board of Directors.